The art of sincere appreciation is rarely exhibited in the workplace today. In fact, studies have shown that only 10% of people make the expression of gratitude a daily habit at the office; and 60% rarely or never express appreciation at all. What has been the result of this lack of appreciation in the professional world? Low job satisfaction, high turnover rates, reduced productivity, and increased stress. In contrast, leaders who express appreciation for their employees' work are able to drive increased efficiency, while simultaneously keeping their team members happy. You may wonder, though: "Why exactly is appreciation such a crucial leadership skill? How can it be developed and expressed?" Let's consider the answers to these questions, and the potential impact on your company. For managers and organizational leaders, expressing sincere appreciation is a vital skill to master and maintain. Great employees don't quit their jobs because of the company, or even because of the workload. They quit because of their supervisors. TheBalanceCareers.com indicates that a poor relationship with the boss is the number one reason why employees decide to pack their things and move on. Lack of appreciation is a key factor in such a toxic relationship. Here's another reason why appreciation is so critical for organizational leaders: the loneliness epidemic. 53% of Americans regularly report feelings of loneliness and isolation at the office. With such chronic stress triggers in place, it's no wonder that many workers are delivering a sub-par performance on a daily basis. On the other hand, fostering a culture of appreciation can work wonders for your employees' job satisfaction, productivity, and longevity with the company. People thirst for appreciation. Hearing a heartfelt "thank you" for a job well done can provide more motivation than a thousand pre-fabricated certificates of achievement. It can even provide more motivation than a pay raise. Research conducted by O. C. Tanner found that 37% of employees believe that more personal recognition would encourage them to be more productive workers and higher performers. In a study of fundraising efforts for one university over a 2 week period, Adam Grant and Francesca Gino found that when fundraisers received a personal visit from the university's director of annual giving, they subsequently increased their fundraising efforts by 50% more than those who had not received a visit. The difference maker? The director's personal expressions of appreciation for their hard work. Instead of a mere afterthought, sincere expression can provide the "glue" that unites and motivates team members to consistently deliver their best work. However, for such a culture of appreciation to be truly sustainable, company leaders must set the tone, by word and by deed. While genuine appreciation is not a technique to be mastered, but a condition of the heart, there are practical steps that leaders can take to show how much they value each of their employees. Take time to build rapport. Some managers keep strict boundaries between them and their subordinates, preferring to limit their interactions to purely professional matters. However, a better approach would be to spend some time every day getting to know their employees one on one. Keeping the lines of communication open in this way will foster feelings of mutual trust and respect, which will in turn allow their employees to more easily accept their sincere praise and commendation. Develop good habits. It costs nothing to say "thank you," or "I really appreciate your hard work." Yet, too few managers say such things on a regular basis. Leaders should make it their goal to develop the habit of expressing appreciation for a job well done. 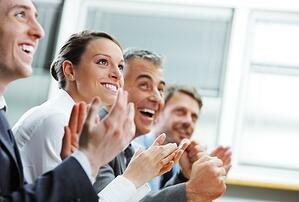 When one of their team members does something well, no matter how small it may be, they should commend him for it. This will create a warm, nurturing atmosphere for everyone in the office. Don't forget the personal touch. When a leader expresses sincere appreciation, it shouldn't be with generic, cookie-cutter statements that are doled out to everyone in the same manner. The manager should be specific in his commendation. Furthermore, he can express his gratitude in different ways; perhaps in a handwritten thank you note or a personal email to the employee. Such personal touches send the message loud and clear: "I see what you're doing, and I truly appreciate it." Match your appreciation to the individual. We are all geared differently, and perceptive leaders will not try to express appreciation in a "one size fits all" approach. For instance, some of a team's more gregarious members may enjoy receiving public praise, such as through an awards ceremony. Other, more reticent employees may prefer commendation to come in a one on one conversation, or over a cup of coffee. Developing a keen sense of each employee's personality and preferences will enable discerning leaders to match their expressions of appreciation to the individual. Managers and leaders must express appreciation to their employees for the company as a whole to achieve continued, sustainable success. Some managers come equipped with a refreshing disposition, and built-in communication skills, such as a facility for habitually giving praise and commendation. Other managers, however, may need training in order to bring out the best of their qualities. Leadership development programs, like those provided by NexaLearning, are key components that can empower those in leadership positions to ignite the flames of joy and passion in their team members, and inspire them to deliver consistently strong performances in their organizational roles. The high ROI for committing to leader development can hardly be overstated. As your leaders develop the art of appreciation, your workplace culture will flourish, your company will attract top-tier talent, and your business will enjoy continued growth. If you are interested in exploring options for leadership development programs, reach out to us at NexaLearning today for more information. Our foundational, practical, and highly customizable courses ensure that your organization will reap the maximum benefits from the education we provide. Never underestimate the power of appreciation, sincerely expressed. After all, "a person who feels appreciated will always do more than what is expected." Download our whitepaper "Techniques for Retaining and Engaging Your Workforce." If your organization is aware of the tremendous cost associated with turnover, and you realize you are losing some of your best people, it is important to assess the symptoms and address methods for enhancing employee retention.